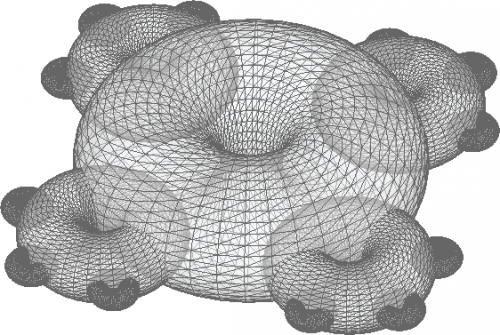 Torus network: a proposal for Human social evolution based on technology and geometry. Proposed and developed by Sabrina Presti, experimented at the CIC. 2 Generalization A better definition? 2.3 Scalability How to grow? Everything is changing these days, evolution gives no truce. A revolution bigger than industrial revolution is coming. ¾ parts of the world is under poverty. One thing is clear: we are not well organized. The only really new factor in modernity is technology. Technology evolves at exponential speed. This is faster than life evolution. Some people talk about the singularity point where technology will come unpredictable because of the evolution of artificial intelligence over human intelligence. I think that, before that, we will use technology to improve our own intelligence. This phenomenon is supposed to be near 2040. So nowadays human evolution is, for sure, related with technology. Capitalism, is not so good. Money is totally polarized, free market is a lie, we are overpopulated, generating a lot garbage, producing things designed to break and the environment is crying. Capitalism was designed for human expansion and it works good for that, but now we are 7 billion people, we touch each other, and we see that our planet is not infinite to keep expanding. Competition, rather than generate improvement, generates destruction. Sometimes for other people and sometimes for our people. There is always a winner and a looser, but we are all together in the same world, so finally we all win or we all lose. Maybe this is the first thing we have to understand to evolve. We need a new way or organization. We need a new paradigm that makes this one obsolete. Let's try something. We live in the competitive world, do we? Human social structure is based on competition because we created it. Cells, for example, live in cooperation. They are self-organized systems. Bees and flowers cooperates too. Ants, bacteria, archaeas, viruses, etc. Cooperation is a wide social mechanism in life. Darwin said “natural selection” and it does not mean “competition”. Capitalism is not as natural as we think. Let's use geometry to define cooperation. When two persons share the same objective they are cooperating, when two persons have different objectives they are, soon or later, competing. To scale up in competition we create a hierarchical structure where everybody shares the chief objective. To scale up in cooperation we create a group of people that share the same objective. Nobody wants to work for somebody's else objective so we do it for money. The chief doesn't want to pay so much so we find competition inside hierarchical structures. By the way, the chief needs to maintain the structure so he competes against other hierarchical structures. Finally everybody is competing, in many occasions to give the same service. This is not efficient. Cooperative groups instead are personally motivated by the objective. They work together in a self motivated environment and sharing knowledge usually speeds up the result and creates new cooperation relations. There is no need to compete with other cooperative group. It is easier to cooperate together. In hierarchical structures, decisions are taken by high level people, there are opinions from others but not discussions. In cooperative environments decisions are more complicated as long as everybody has same right and probably different ideas, methods and experiences. This is one of the main reasons why traditional cooperative groups don't scale up easily. As we see in the figure, a triangle is a good geometry to represent competition and a circle is a good geometry to represent cooperation. As long there is no vertex, there is no especial people. Now, let's find a way to keep shared common objectives as time goes by and the group get bigger. Self-organization is a form of overall order that arises out of the local interactions in an initially disordered system. This process is not directed or controlled by any agent or subsystem inside or outside of the system. It is constructed by individuals and learning. The resulting organization is wholly decentralized and distributed over all the components of the system. As such, it is typically very robust and able to survive and self-repair substantial damage or perturbations. Self-organization occurs in a variety of physical, chemical, biological, robotic, social and cognitive systems. Cells, neurons, some fishes, flying birds are examples of self organized systems. Everybody knows what to obtain global benefits. Although traditional paradigm thinks that natural selection is related with competition mostly, there are other people that think that selforganization is an important part in natural selection. Me too. Human being is, mostly, not self-organized. But that is maybe because of our education. We are educated for competition and capitalism. What would be if we are a little more self-organized. Finally human being is made over self-organized cells and neurons. Self-organization is definitely an important part in cooperative philosophy. This represents an individual and philosophic change. You cannot leave a hierarchical social structure to get into a cooperative social structure if you expect someone to give you orders. Cooperative groups are organized based on the common objectives and common objectives are based on the interest of the group. So we are in a closed loop of reactions. Group decisions → group objecCves → group acCons → group decisions ….. and so on. I define group consciousness as a transformation element of the people that form the cooperation group. The more group consciousness more evolution of the group. The name refers to its meaning  but if you feel uncomfortable with this definition you can take it as an arbitrary name by now. 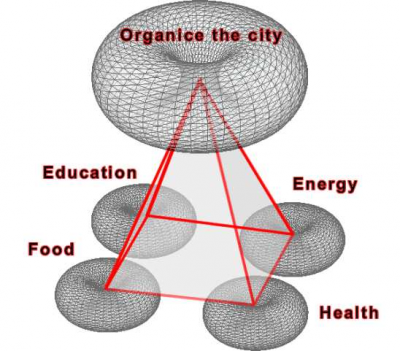 We have a geometric representation of a cooperative group and common objectives. Because group consciousness is an abstract concept we need some physical support for it. Now let's put some technological support. Objective: The objective keeps the group together. It is defined at the beginning and keeps the same as time goes by (or eventually changes if everybody is in agree with it). The objective is the seed that creates the group and gives identity to it. Is the dynamic representation that all people see when they look at the objective and other related information needed to generate actions. Because people evolve their interest, proposals and methods, it can change constantly. Its aspect is different from case to case and its geometry is the yellow cloud in the center of the circle. When you suggest an idea or method to get to the objective you are directly influencing the reflection so everybody can see that and react according to it. You can influence the reflection only if you are part of the group. It is important to notice that you are included in that reflection. Now let's use these geometry and definitions to create group consciousness by construction. Start a closed cycle of iterative influence based on: everybody say something → reflect ourselves → everybody say something …. and so on. The question is: What's your favorite color? 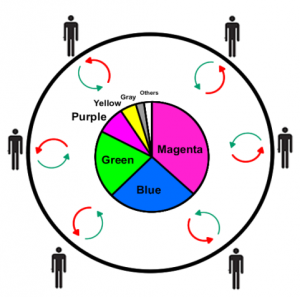 It is easy to see that the favorite color of the group is magenta. Everybody can see that blue is second and so on. Probably you will think: “Magenta??!! It is a little surprising, it is not a common color”, well now you know something about the group you are in that you didn't know before. Maybe you will take it in consideration next time the group talks about colors. This is how you fell the reflection. This is a very simple reflection method for a very simple objective but it works. Notice that the iterative influence is always open, so this result can change every week or every day. The reflection is the living representation of the group consciousness. About favorite color in this case. All these concepts are already implemented in an application called Nabú that is being tested at CIC . 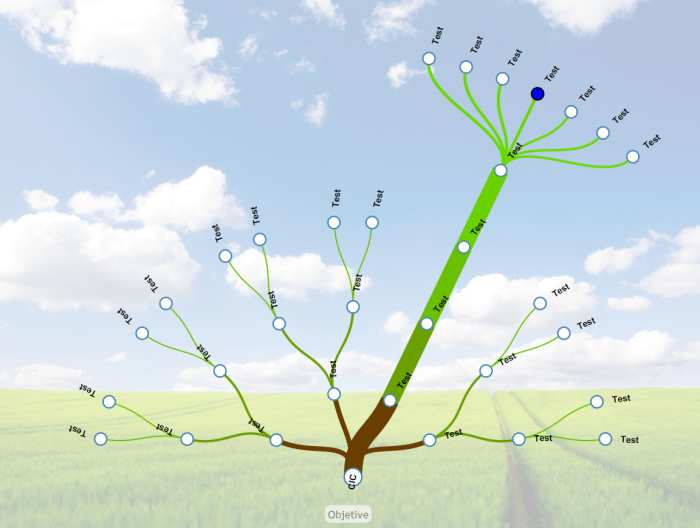 Nabú is a big scale decision tool for cooperative groups. It starts from an objective and reflects constantly all the information people say, creating group consciousness. The final purpose of Nabú is to write consensus documents. These documents are the result of everybody's opinion and the generators for real actions. To start a real action a consensus document is needed. Everybody can purpose a complete document at any time or just a part of it. 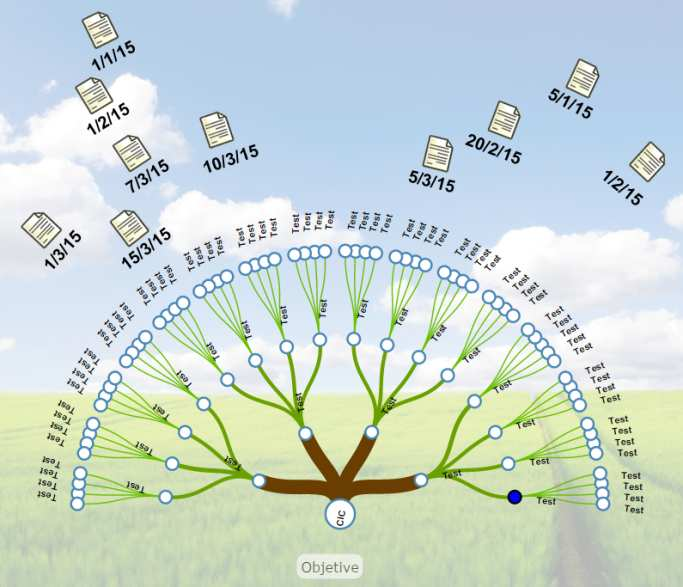 All parts are represented in a tree (reflection method) so everybody can see the map of proposals at any time. 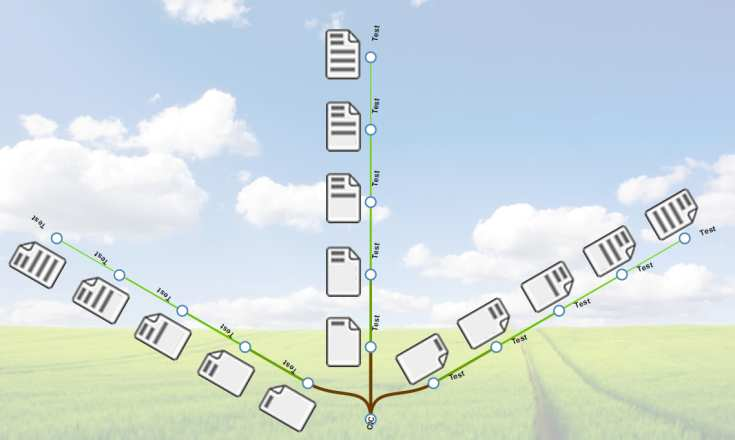 Documents are written en 5 levels from the root to the leaf. Starting with an introduction (more abstract part) to a budget-and-final-date (more concrete part). In this figure there are 3 documents proposed. So we can say that the group is talking about 3 topics. When you start a new document at level 1, Nabú lets you select a document template from a list. So it is possible to start different types of document discussions. When you see the tree you can find parts of documents that you are in agree with and parts that you don't. When you are in agree you can vote it putting a flower over that part so the branch become wider. If you agree with the proposed document but only until level 3 then you can propose a variation for level 4. Opinions (parts of documents) are anonymous. This is a very important detail. When you say something to the group then it is not yours anymore. It is part of the group consciousness now. When you put a flower on an opinion the branch becomes wider. And thiner if you recover it. You always see your flowers in the tree but you cannot see flowers from other people. 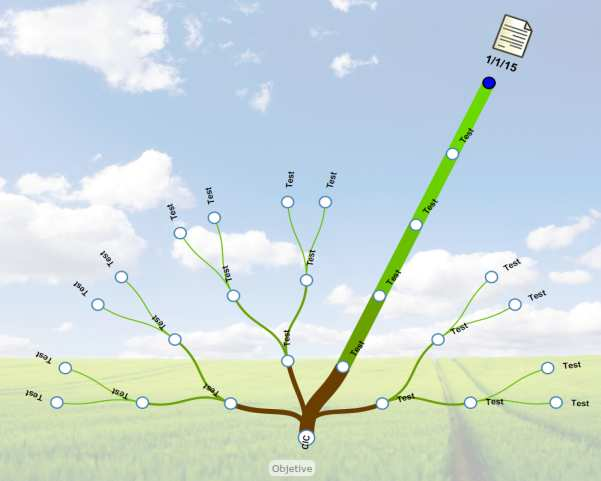 The most important learning about the tree is to see quickly documents that are converging and documents that are diverging. Convergence is near to consensus and divergence is far. 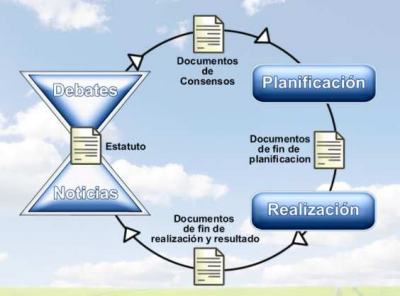 In a cooperative group we need consensus documents to start real actions, so everybody wants to construct consensus document. In this example we see 4 discussions (level 1) and all of them show divergence. This means that people has different ideas in all levels. None of these discussions is near to a consensus. The group will have to wait and evolve to start real actions. How do you feel this reflection? The reflection is open all the time so this situation can change soon, as people creates new proposals or moves their flowers. As soon as people evolve. As soon as you evolve. Here we see 1 discussion near consensus. 2 proposals differ en each level but they didn't thrived (by now). The main branch is wide so many people is in agree. This situation is near to start real actions. Divergence should evolve to convergence. That's would be a constructive evolution. One topic is converging until level 4. At level 5 people is in disagree. Let's see what happens after some time. When a branch reaches the consensus condition then Nabú writes a document with the content of the 5 levels of that branch and add the actual date to it. The document is now a fact in time. Some condition about people in disagrees. Not much and not grouped. Because the tree changes all the time, after a consensus people probably will change flowers location to construct another consensus. The consensus document is the fruit of the tree. 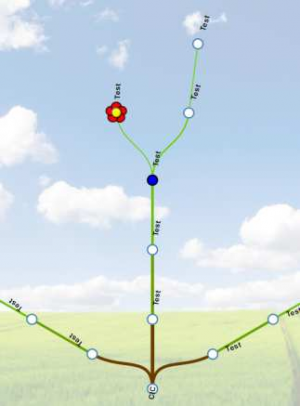 Consensus documents go to planning and production stages. The result of the production (a product/a method/a committee/or whatever the consensus document say) goes to people of the group. So the group enjoys the results of the group decisions. This will probably generate new feedback info. This feedback info will be the starting point for new discussions, about improvements for example. 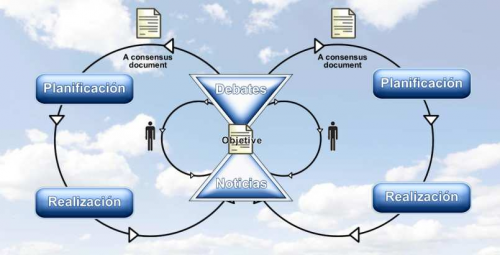 Finally: Discussions generate consensus documents, that generate real actions, that generate real results, that generate feedback, that generate new discussions.....and so on. We are in a closed evolution cycle again. This looks familiar, don't you think? Nabú is an open-source project and it is in testing phase now. 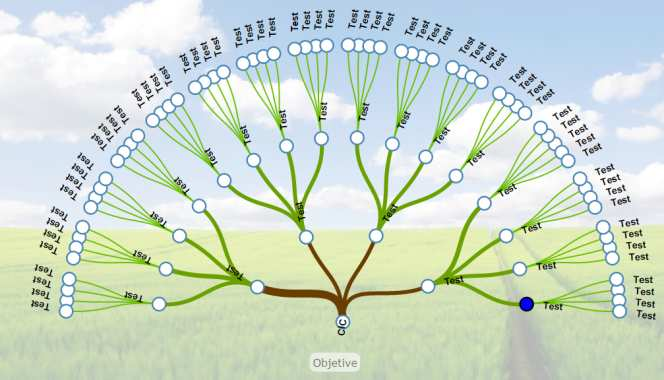 Any software system, based on any objective, that works like Nabú creates group consciousness and then evolution. Now let's combine cooperative geometry with influence geometry and reflection geometry. The torus is a very curious, interesting and deep shape and its geometry has all we need. We will call the center of the torus the “reflection point” as well as we did with the center of the circle. 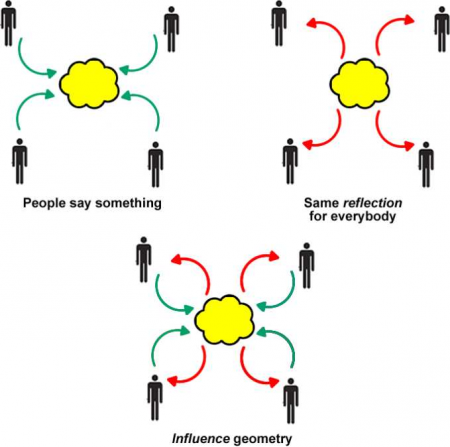 We can see that influence geometry fits perfect and egalitarian circle of people too. The closed cycle of influence generates iterative evolution. The iterative method is a formal and mathematic technique used is many scopes based on big data inputs and chaotic systems. This method pretends to approach gradually to a solution throw iterations in time. And that's exactly what we do here. Interaction is usually related with action-reaction. And it is true, but it is more than that. If reaction is out of time phase with action then it is not interactive. Interaction is instantly. This phenomenon creates special reactions in your brain. 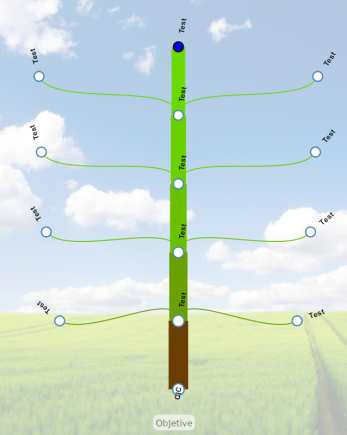 Planting a tree is an action-reaction example. Playing a music instrument is an interaction example. You can study music theory (and it is great) but you can also learn by practice. By interaction. The reflection should be as interactive as possible. So finally you will know the group consciousness of the group you belong to just by looking enough time at the reflection. The group consciousness is just the extrapolation of the individual consciousness and that's what you see when you keep on looking at the reflection. The reflection method should be such that all dimensions of information that comes into the reflection point are present in the reflection result. Whatever people say is in the reflection. We will call this “reflection without loss of info”. In the other hand, all the info that people say should be enough and directly related with the objective. This is how we close the cycle of influence between what people say and what people see. If the information received is not appropriate or the reflection method loses info then the evolution of the group will be slower or maybe never happen. The Torus geometry is very clear in this aspect, all the lines that goes out from the reflection point goes in again. All the energy that goes out goes in. All the information that goes out goes in. The Torus is, by its definition, a closed cycle geometry without loss of info. The reflection image is a good example of information quality. And it is a challenge in terms of data visualization techniques. Looking at the planet earth from far is a nice example of global reflection. We are all included in that reflection. It is not interactive because pictures are not updated in real time but we can learn, for example, about green zones in the planet and compare them with the next pictures updates (after few months). In this case we can see the planet reaction to human deforestation and react according to it. It is server oriented, Google is special people, so it is not egalitarian. The code of the application is closed so we have to trust Google about the information we see. And finally it is made for people to look at local maps. So nobody spend time looking at global map. Google earth is a nice approximation to global consciousness but it is not focused on that so evolution of global consciousness is slow. It doesn't work. Once a year Google publish the ranking of most searched words. It is interesting to know what the world was thinking about, in average, that past year. What could happen if we have access to that information in real time? We could know what the world is thinking at anytime. Imagine global reactions when some country begins a war or some important politics decisions. Imagine we can know what the world is thinking about by country. Once again it is server oriented so we have to trust in Google and it is not interactive (for us at least). It doesn't work. Wikipedia is a cooperative project. You say something and everybody can see that. You can query for one topic at a time so you cannot see one single and global reflection image. You cannot see global information about hot topics, evolution of topics, tendencies, how many people use the information by country. Finally you cannot learn about global knowledge. It is server oriented so Wikipedia team is special people, it is not egalitarian. It doesn't work. Everybody connect to the video game server and everybody share the same scenary. It happens in real time so it is interactive. If you can zoom out to see everything then you can learn what's going on there. Unfortunately all these games are based on competition and players are focused on local maps so there is no global knowledge. It is server oriented and closed code. It doesn't work. Groups can grow but always sharing the same objective but we need many objectives to confront complex tasks. A complex task is usually defined in terms of smaller tasks. This is how we approach to a big objective. A common way of doing it is using Work Breakdown Structure (WBS). Tasks are objectives. Usually we assign objectives to persons, here we will assign them to cooperative groups. In fact, to Torus. Objective: Create objective hierarchy but equality of people. Objectives are responsibility of the groups. Not of individual persons. People who cooperate in that group in that moment is in agree with the objective and they do it by self motivation. They are free to change to another group or simply leave it. But the group will be still related with the same objective. To combine different groups we need some geometry. This geometry should be such that groups can combine with others in any direction, scale-up and scale-down, so the network can adapt to the real world needs and changes. A big objective should be able to ungroup to a combination of smaller objectives. And many small objectives should be able to group in a big objective. Fractal geometry is perfect for this. Fractals where defined in the 70' by Benoit Mandelbrot and after that we realize that there are fractals everywhere in nature. They are self-organized by definition and they show periods (zones) of chaos and periods of order, like real life. Fractals seem to be a very important geometry in the universe. This is an example of a fractal Torus combination. Torus combination is infinite in any direction. We can create new Torus or kill one so the network can adapt. Vertical rings of the big Torus are connected exactly with the center of the smaller Torus. Combination is perfect and simple! If we translate the central torus a little up then we can see the hierarchy triangle again. Now we have a geometry to combine Torus in a hierarchical way. Every Torus has an objective and all of them are cooperating together. Let's see what happen with Influence. Because vertical ring of the big Torus connects directly with the center of the small Torus, influence scalability is trivial. The reflection of the big Torus flows directly to the influence of the small Torus. And what people say in the small Torus flows directly to the big Torus. This means that people from small Torus influence in the big Torus. People from small Torus IS part of the big Torus. But people from big Torus have no influence in the small Torus. This kind on influence is called principle of subsidiarity and is a basic rule in traditional social cooperatives and the European union. Subsidiarity is a principle of social organization that originated in the Roman Catholic church, and was developed following the First Vatican Council. It has been associated with the idea of decentralization. In its most basic formulation, it holds that social problems should be dealt with at the most immediate (or local) level consistent with their solution. This influence direction is totally opposite to the orders in the traditional hierarchical triangle structure. People from small torus influence in bigger torus because they are part of it. 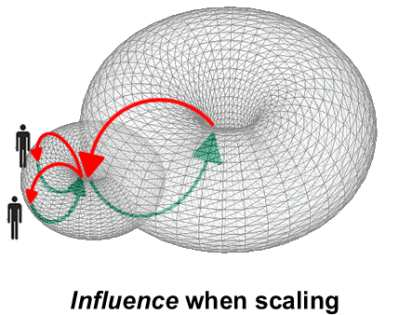 But people from bigger Torus cannot influence in smaller Torus. Some Torus decides to cooperate between them and create a new Torus over them. This is how different Torus start a cooperation relation. We need new people for the new Torus, red people is the new people. Using these two scalability rules any Torus network can grow or shrink according to the needs. I see 2 kinds of physical support. Physical access to the server creates special people. Administrators, owner, etc. 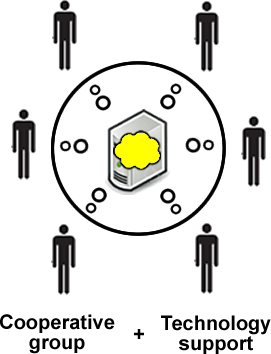 In the other hand, Peer-to-Peer(P2P) means one single application that share information with others without server. 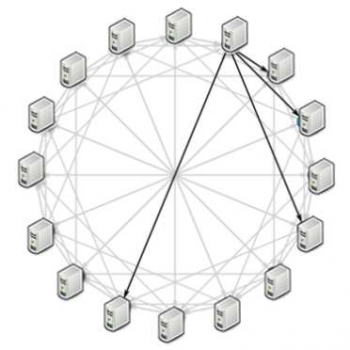 P2P architecture is basically a ring. All applications are connected creating one virtual server application. Once again we can see how perfect it fit with the Torus geometry. Notice that an open-source project is basically a cooperative group sharing a common objective. A Torus system is based on the reflection of the individual consciousness of the group and uses iterative evolution to converge in time. At the beginning is probable that the reflected information shows a big divergence and convergence will look impossible. People will be surprised and some people will say “this is not working”. Patience! The Torus will synchronize gradually the main differences. Evolution takes time. We have been talking about group consciousness as an arbitrary defined name but this topic was introduces in 1893. Group consciousness should be understood as a new consciousness, like a new person, in this context the hole is more than the sum of its parts. People synchronize using the reflection to create a new consciousness. Finally that's all about. People synchronization! Technology is very important, there is no other way to do all this. 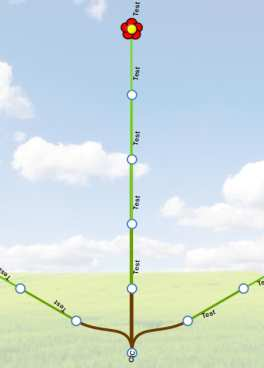 The Torus network is a tool designed to synchronize people. Maybe it is time to evolve from individual consciousness to group consciousness. From lower levels of consciousness to higher levels of consciousness. You can think this geometry is nice but has nothing to do with people but our actual social hierarchical structure is geometry too. Geometry is a formal language, clear and solid enough to support all these compositions. It would be a mistake to think that geometry is not able to prove concepts and/or create new knowledge. There is people who think that the unified theory of physics, the holy grail of physics, is geometry. Don't think in terms of words or images, think in terms of geometry. About people we never know. The Torus network works only when people works too. All these reactions and interactivity shown in this document is impossible without a group of cooperating people. So the most important conclusion is what you believe rather than what I can prove. You cannot solve the problems with the same mentality they were created, you have to change the way of thinking first. You can see torus all over the universe. 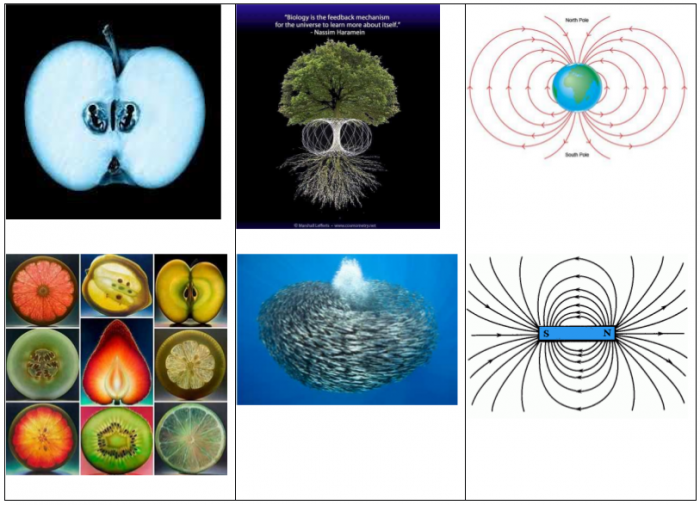 You can see torus in an apple, in a tree, in the magnetic field of the earth, in fruits shape, in fishes swimming, in magnetic dipoles, your eye is a torus, in many vegetables, in atoms, in twisters and much more. 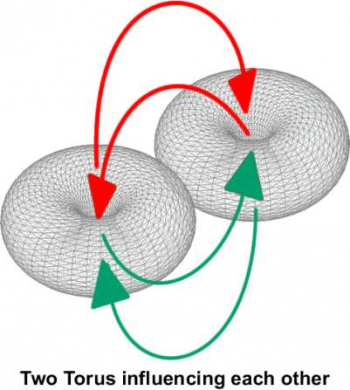 Marco Rodin has defined Vortex Based Math in the 90' like “the way energy flows” and it is based in the torus geometry. This is very important. He created a coil called Rodin's coil that is extremely efficient and its shape is a torus. This new mathematic is being formalized now by his disciple Randy Powel and promise that free energy engines are possible when their magnetic fields is a torus. In the cosmos, black holes are also described by a torus geometry. Galaxies are based on torus too. The universe is supposed to be a torus. The torus is probably the most repeated pattern in the universe. In fact, the universe is a torus factory. This universal fractal torus network is exactly as our torus network. Torus network construction by hierarchy is not the only way. Two torus can live in duality as well. Let's see how useful is this. In mathematics this relation is called symmetry, in biology it is called symbiosis and in eastern philosophy it is called duality. They influence each other but they keep their identity. Both torus can create a new identity to be seen as one. This would create a new torus and a new higher level group consciousness. Many things in existence live in duality. Nature shows many ways of constructing things. The torus network too. Can you find trinities in nature? A is related with B and B is related with C, then A is related with C. Another way of combining torus is to include one inside another. Let's use the environment as an example. When the reflection interaction reach the action state (fixed point, consensus, majority, deadline or whatever) a real action starts that causes changes in the environment. The effects in the environment generate new influence to start again. In this case people of the group are in constant evolution with the environment. This two torus share the same reflection point. In the inside torus people evolve their consciousness and in the outer torus people make actions that affect the environment. And the environment influences the inside torus too. Always in a closed evolution cycle. In Nabú, we have a closed cycle about decisions and a closed cycle about production-and-feedback. Do you remember the main menu? Can you see the Torus now? Every person defines a cycle with the reflection point. And every consensus document defines a cycle with the same reflection point. Decisions and actions are related to create higher level group consciousness. We all have consciousness, however we don't know where is it in our body. The scientific approach sees the body as mind-body (a concrete duality) and consciousness in mind, eastern culture sees it as mind-body-soul (a trinity) and puts the consciousness out of the body, over the head, in the seventh chakra. This is more than knowledge, as long as knowledge is mapped in our brains, consciousness is related with enlightenment. Many religions shows high level consciousness people with a halo over the head too. If consciousness is an effect of reflection it is easy to think that it could be out of the body. Where will we draw the group consciousness? Consciousness is related with life, inert objects are supposed to not have consciousness (let's say). Animals have consciousness; about they are alive for sure. Humans have a very good individual consciousness; some people have consciousness about other people and situations. We can talk about levels of consciousness. Animal consciousness, human consciousness, group consciousness, global consciousness, solar consciousness, universal consciousness. Do you train your consciousness? Sacred geometry studies the basic geometry patterns of nature and cosmos (nothing to do with religion), the mathematical bricks of the existence, symbols and formulas like π, golden ratio, Fibonacci, flower of life, and more. The flower of life, for example, appears in all human ancient civilizations, curiously, with the same name. The geometry of molecules in the periodic table is in the flower of life and the torus, of course, is there too. The traditional scientific method is changing drastically since quantum physics. Now the observer is part of the experience, so sometimes the experience in not repeatable or quantifiable (this is basic in traditional scientific method). Your attitude affects the experience. You are part of the experience! Many approches studies the torus. Some of these concepts are not totally accepted by traditional scientific community but what is the challenge about researching if we don't try new things? Science is the search of the truth and we are searching using geometry and technology. The torus is definitely a very curious shape, it appears everywhere. It is not surprising that we can use it to improve big scale cooperative groups. From now the decision is personal: go on trying to fix this actual global organization, or be part of a new one. But where is the group consciousness in our drawings? The group consciousness is the result of mixing people, reflection and geometry. The group consciousness IS the torus itself! It exists and hug the group, although it is invisible. If energy flows in a toroidal way, according to Vortex Based Math, so energy tends to create consciousness. That's its natural evolution. Human being is evolving to higher levels of consciousness and it is not an issue of humans, it is the evolution of the energy and applies to all kind of living beings. 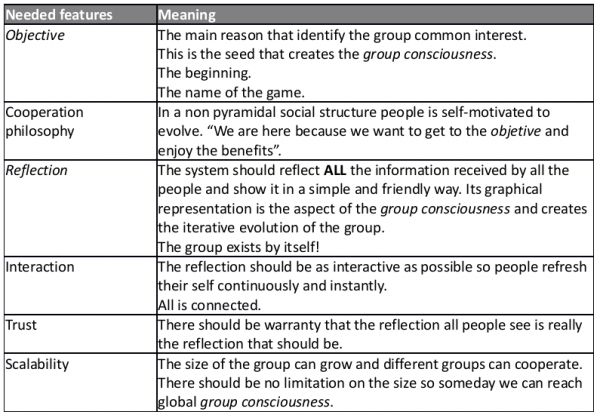 Use these concepts to develop different applications that create group consciousness. I personally suggest the 5 biggest monopolies of the world: Education, news, health, food and energy. Thanks for reading! This page was last modified on 3 August 2015, at 16:00.